You can dance with us if you want to”. 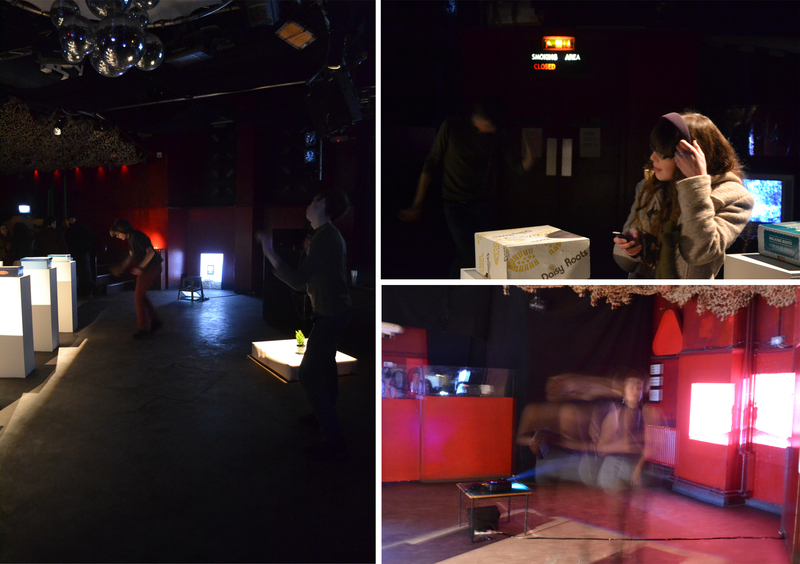 ‘Would you like to dance with me?’ was a site-specific work for the ‘Come Here Often?’ exhibition at The Bongo Club, Edinburgh, taking place on the evening of Wednesday 5th 2012. The work consisted of an audio piece featuring a range of interviews with people, talking about how they feel in clubs, dancing with strangers and dancing in general; the interview was mixed with their favorite song to dance to. In the exhibition four dancers, listening to music on headphones, act as a reminder of the club that Bongo is the majority of the time, dancing throughout the night to the soundtrack of the audio work. Within the exhibition the audio piece was offered to various gallery visitors by the artist on an mp3 player, donning the headphones the viewer becomes one of the head-phoned dancers, and can, if they choose, become one of the dancing crowd. Works for some people in a room and little else. In 9 parts. Yeah, its ok, might be, all good, yeah.